“Go the F**k to Sleep” sounds a wee bit abrasive, right? It is around 8:15 pm at this point. My kids that can tell time immediately start arguing with me because bedtime is normally at 8:30 pm. But after fighting with them over dinner, mommy is about to lose her marbles and it is time for them to go the f**k to sleep, right now. My four-year-old, Kassidy, throws herself to the ground and starts screaming like she’s being kidnapped. My two-year-old, Kashius, starts playing like it’s mid-morning. I explain to the oldest three why I am mentally drained for the evening and they need to just do what I say before it gets ugly. My oldest then proceeds to say she has homework. I swear, y’all. I am going to explode. You wait until bedtime to tell me you’ve got work to do? I immediately start yelling and then my husband comes downstairs and tells me to “calm down.” Wrong thing to tell me during the bedtime struggle. I start dishing out insults to everyone that’s asking for one. My kids shower at night. They used to shower every morning, but after having so many it is easier time-wise for showering to happen at night, (aka, mommy doesn’t want to wake up 20 minutes earlier to facilitate showers). Now that I have older daughters, (12, 9, and 7) I rely on them to help me get Kassidy (4) showered. They head upstairs with Kassidy still screaming and 20 minutes later I still hear screaming, running, bumps, booms, and bangs. I try to ignore it, but at this point, it is near nine o’clock. I run upstairs and the girls are naked, chasing Kassidy around, who is refusing to get in the shower. The girls look at me completely defeated and all I am thinking is, skip the shower and go the f**k to sleep. I know they must shower so I have to turn into crazy-mom and force Kassidy into the shower. She cries hysterically, throws water and glares at me like I am the meanest mommy in the world. Kashius… crap. I forgot about Kashius. He doesn’t get to shower tonight. I just do not have the energy. He can stink until tomorrow. I swear, sometimes even helping them put on their pajamas seems like an impossible task. “I don’t want to wear those,” “These don’t match,” “These are too tight…” All of which I can care less about. I just need you to go the f**k to sleep. My oldest three are pretty good once they lay down, two of them must listen to channel 943 the “Soundscapes” soothing music station in order to fall asleep. I do not care if you listen to heavy metal, as long as you go the f**k to sleep. Three in the bed, two to go. This should be a piece of cake, right? WRONG! Now we enter the purgatory phase of the bedtime routine. My two youngest share a room. They have bunk beds. In a perfect world, I would tuck them in, kiss them and they’d drift off to sleep. We all know this ain’t a perfect world. They are fighting, unwilling to lay down and trying to escape out of their room like convicts. 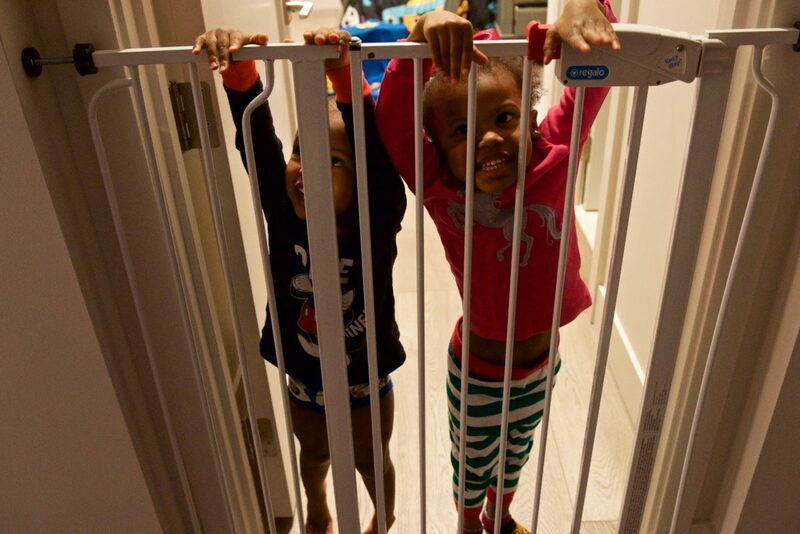 We even have a baby gate up so it’s harder for them to escape, but somehow, someway they manage to get out. Marcus and I spend the next hour getting up and repeatedly putting them back into bed. We even offer to put on a movie for them. After 15 minutes of fighting over what movie to watch, they make a decision. We turn off the lights and head to our bed. Having these two share a room was the worst decision EVER!! 10:30 pm: “MOMMY! MOMMY! MOMMY! MOMMY! MOMMY! MOMMY! The movie is over!” Perfect, go to sleep! Cries and screams come from their bedroom. “No mommy! We’re scared! Please, mommy!” I get up and put another movie on for them. Kassidy falls asleep shortly after. 11:30 pm: “DADDY! DADDY! DADDY! I have to potty!” Marcus drags himself out of the bed and takes Kashius to the potty. I get up and go into his room and there is no trace of blood. I tell him to get back into bed and then he says he’s hungry. I go downstairs and get him some goldfish and I put him back in his bed. That boy better go the f**k to sleep, now. 12:30 am: Cries come from the bedroom again, “MOMMY, MOMMY, MOMMY!” This literally cannot be my life. My son cannot still be going hard in the paint at 12:30 am. I am delusional at this point. I stumble into his room and he looks at me and says, “Mommy, you sweep wif me, mommy?” I collapse onto his bed, he cuddles next to me and whispers “Now you go the f**k to sleep, mommy. I win.” Just kidding, he doesn’t actually say that, but I am sure if he could, he would. The only sure way to get my last kid to go the f**k to sleep is to go the f**k to sleep with him. So I did. There you have it. 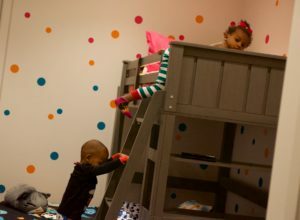 This is a typical bedtime struggle in the Trufant household. I know many who will try to give me advice, tell me what I should or should not be doing or how kids are running the bedtime show. But no need to tell me, because I’ve heard it all. Yes, my kids do run the show. My husband and I are completely outnumbered and completely content with being out of our minds. Our bedtime struggle is not ideal, but it is what it is. I know the struggle won’t be forever. Pretty soon we will be longing for the days when our kids were little and simply wanted mommy or daddy to sleep with them. Even though nighttime is rough, I wouldn’t change it for the world. Now excuse me, while I go the f**k so sleep!